The U.S. Presidential election has not been about the economy, conflicts around the world, mergers, banks, gas prices, the recession, or spending. It has been about looking for someone to lead. It will be many more hours before Barack Obama is elected the next President of the United States but the tension seems thicker today than in the last two years of campaigning. This is it, time to step up and prove all the things promised. If the over 600 polls are correct, the Democrats will have the next four years to clean up the mess. If the polls are correct, there will be more people out today to vote than in any other election in American history. This is not about whether people will lose their house or pay their credit cards. This is about leadership. The nicest car in the world is useless without a straight frame or axles, the best laid plans are empty without action, and it takes leadership and a vision to carry it off. The mistake most make is to think one person in front of the line is leadership. If it takes a village to raise a child then it takes a team to build a company or country. 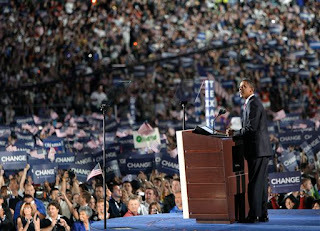 Barack Obama is not making up a game plan on his own; he has a strong experienced team working with him. Once the balloons fall and the champagne consumed, my hope is that what is left is leadership. And when we have strong leadership in anything we do, we're halfway there. If not, we will drink the sand.